My eldest daughter got her first tooth on Mothers day when she was almost 8 months old. I remember how much pain teething caused her, the red cheeks, dribbling and endless crying. Teething really was an uncomfortable experience for her. My youngest, on the other hand, started teething at 4 months old and they never really bothered her. She would chew everything she could get hold of, and loved cold things to chew. I am hoping Baby takes after my youngest daughter. I thought I would put together a few things I found worked well in the past. Nuby have a fantastic range of baby teething toys, and even have a teething bundle. My girls both used the teething keys. These can be put in the fridge to keep cold and babies like the cold against their teething gums. We have the teething bundle ready for when thing 3 starts teething. I found that washed and peeled carrots but in the freezer worked well for teething babies. The hard cold surface is great for them to chew and bite their teething gums on. You do need to watch babies though to make sure they don't choke. Also make sure the carrots are not too cold so as to cause bruising on little gums. I always wanted an amber necklace for the girls but could never find one. I have had friends that have use them and said they worked for them. The theory behind them is that a babies body heat heats up the amber beads. This then triggers the release of a minute amount of oil that contains succinic acid, a naturally-occurring substance in the body. The oil is then absorbed which is what causes the pain relief. The idea is to have the amber beads as close to the point where the pain is. Which is why it is a necklace for teething. I would not leave my baby to sleep in the necklace, as I would be too wary of the possible strangulation risks, however during the day whilst watching them I may give it a try. 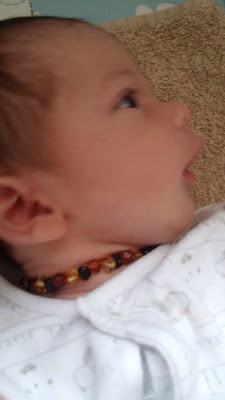 The beads on any necklace also have to be such as to not cause a chocking hazard, just in case baby does accidentally swallow one. I have found a beautiful range of necklaces with different amber patterns which I want to try on Thing3. My eldest daughter would find comfort in Nelsons Teething granules. The granules are poured into the mouth and seem to provide almost an instantaneous relief. For my youngest daughter she seemed to find relief with Anbesol. I found that whilst my daughters were teething they would look to find anything for comfort. Anything that they could grab and bite they wanted. They also wanted to be picked up for comfort. Num Num teething jewellery is perfect for Mums [or Dads] to wear. Num Num are hand made jewellery and each bead is made from food grade silicone, same as bottle teats and pacifiers. This means that the silicon is odourless, tasteless and does not support the growth of bacteria or mould. The beads are also non toxic and are BPA, PVC, phthalate, latex and lead free. 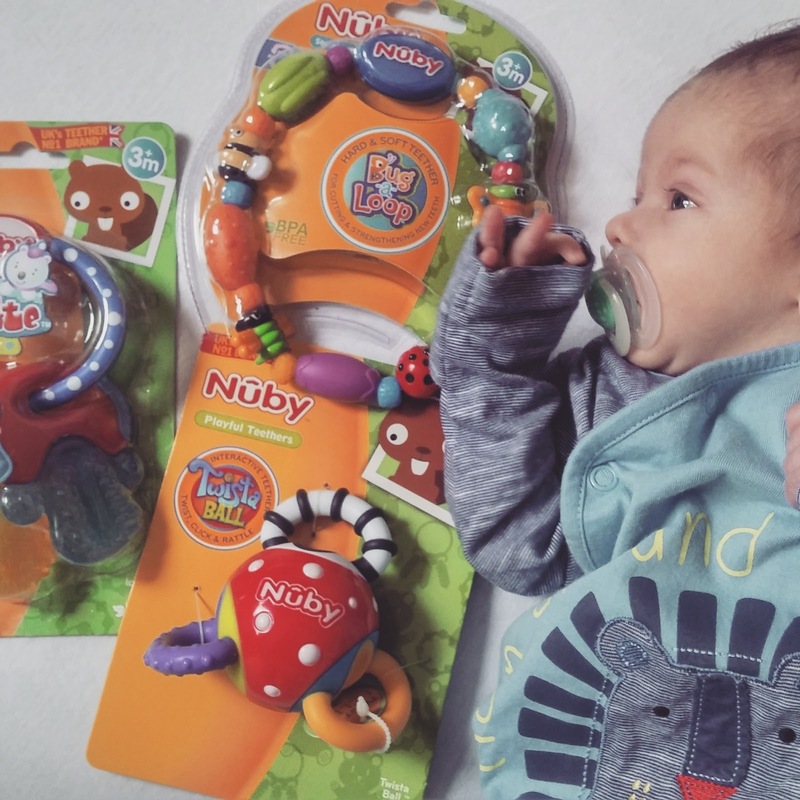 Num Num jewellery are designed for an adult to wear and are not a toy for baby to play with. However when worn by an adult babies can play, and teethe on them. The clasp on the Num Num will also break away if tugged too hard for safety. There is a wide range of patterns and colours to choose from and something to suit all tastes. I have the Hannah Num Num in grey, turquoise, purple. I love that the necklace is named after Jen's daughter, Jen is the Mum behind Num Num. This gives everything a real personalised touch. The colours on Num Num are really eye catching, and grab the attention of Baby. 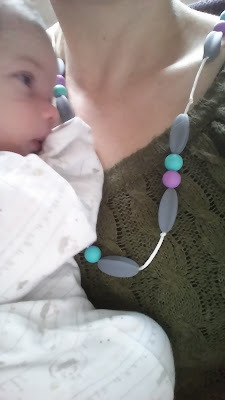 When he is a little bigger I hope he will be more drawn to the Num Num necklace to pull, rather than my hair. The beads have a textured hard feel to them and I can see them being really soothing to a teething baby. Unlike other teething necklaces I have seen for adults to wear, the beads on the Num Num look high quality and not like costume jewellery. One of the great features about Num Num is that not only can they be washed in a mild detergent but they are also suitable for sterilisation. This is perfect for an item that is put into their mouths. If you would like to own your very own Num Num necklace, you could be in with a chance of winning one. One lucky reader will win a Num Num necklace, to enter follow the instructions on the widget which contains the full terms and conditions.